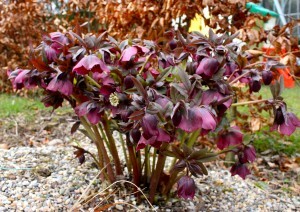 Every garden should have a couple of Hellebores for their beautiful flowers between now and April. Easy to grow and frost hardy, they work anywhere from the mixed border to a woodland area. Once they are not planted in a spot where the soil becomes waterlogged, they will thrive. They can be divided in spring after the plant has finished flowering and are easily propagated from seeds. Seeds can be sown in containers in a cold frame once they are ripe. You will also find that they naturalise very easily too, producing babies everywhere after a few years if you neglect to deadhead, always a cheap trouble-free way to increase your stock! The Christmas Rose Hellebores Niger has already started to flower and I have removed the leaves to allow the flowers to flourish. 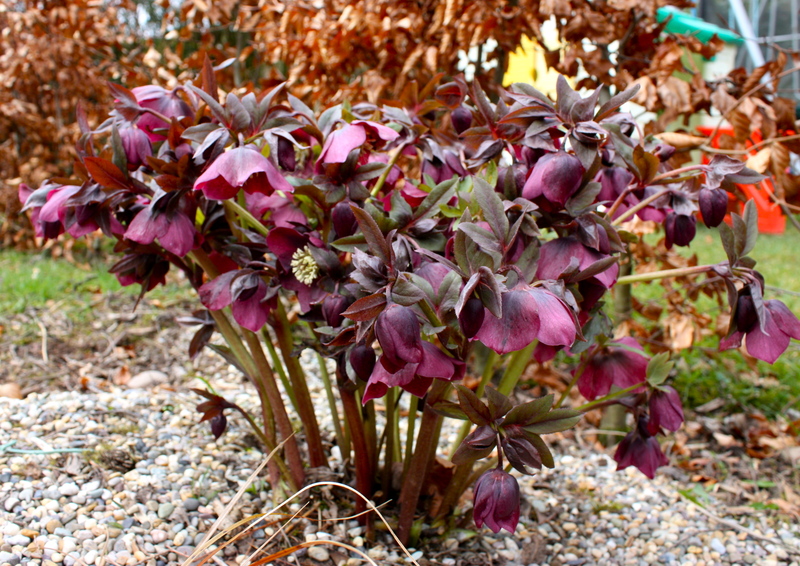 I have also removed the leaves from Hellebores orientalis – the Lenten rose, and have applied liquid feed to encourage flowers. These hellebores will flower from mid-winter to spring producing outward facing saucer-shaped white or greenish cream flowers which fade to pink with age. Jacquemonti Silver birch, with its beautiful white bark, is lighting up one corner of the garden at the moment. The smokebush, Continus ‘Grace’ with its dark red foliage, positioned behind, provides a lovely backdrop. It looks even better in spring when crocuses, snow drops and later on dwarf daffodils surround it. The silver birch prefers dry conditions and can be propagated very easily from seed. Horticulturist Ciaran Burke wrote recently that the name birch means bright or shining in old Germanic languages. It’s easy to see why. You can purchase a nice sized Silver Birch at Nangles nurseries from about €35. My parents have a group of about five planted close together, under planted with dwarf daffodils. A friend has two positioned in the middle of a large tear drop shaped bed, under planted with ferns and Phormium ‘Jester’, with lots of spring bulbs. An uplighter positioned below really sets the whole look off when expecting visitors! Ilex Golden King is an evergreen golden female holly. It will be useful in a couple of week’s time when I’m doing my Christmas flower arrangements. Its striking variegated leaves provides great colour in the shrubbery at this time of year. If planted with a male holly such as Ilex Silver Queen it produce fabulous red berries in autumn and is worth having for these alone. In the early years these can be pruned into various shapes and look great clipped into a standard, which is a single stem with a lolly pop style top. Meanwhile the common holly in my garden has a profusion of fantastic red berries at the moment. I am covering a little bit of it with netting so as to preserve some of the berries for indoor decoration at Christmas, there will still be plenty of berries for the wild birds who we continue to feed as well. If you believe the weather men and women, we are unlikely to see last year’s freezing conditions this side of Christmas. I hope to have plenty of time in the garden over the holiday period free from the usual clock watching associated with school term. My wellies are at the ready by the backdoor and I’m keeping my fingers crossed!